Limestone buildings are standing tall and proud. 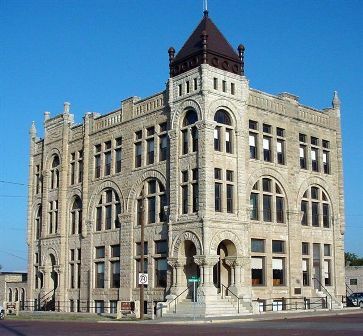 The Ness County Bank Building is one of those such buildings and was voted one of the 8 Wonders of Kansas Architecture. Standing outside you can gaze up in amazement at the wonderful detail on the limestone and mortar. Once you step inside the four-story building you can envision how life might have been in those days. The unique woodwork, the high ceilings, the detailed door knobs and other features take you back. Walk up all the flights of stairs, look out the windows to view downtown Ness City and gaze at the horizon. The Ness County Chamber of Commerce is located on the main floor and is open Tuesday-Thursday 8-11 a.m.. The Prairie Mercantile, is located on the lower level. Open Monday-Friday 1-4:30 p.m.
For a tour contact Ray Witthuhn or Brent Kerr at 785.798.3950.